The CLIA Waived 5 Panel Drug Test Cup is a fully integrated, self-contained drug test kit for detecting drugs and metabolites in urine. 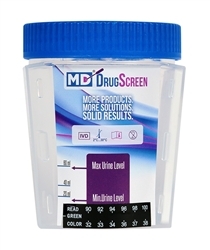 Our five panel drug screen eliminates the possibility of donor tampering if an adulteration test is integrated (look for the AD cups) and provides an easy solution for on-site testing that avoids the handling of urine. Shelf-life: up to 16 - 24 month. Buy more and save more with our bulk order program. With the CLIA Waived 5 panel drug test cup most of the benefits are that with this test there is no tilting, dipping or direct handling of the urine. This test is self contained and when results are read the can be photocopied since the sides are flat. 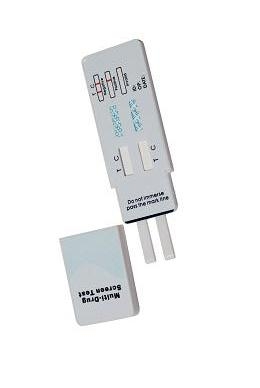 More selection of 5 drug combinations than helps to tailor your needs in drug testing. Also the product lid close tight and is leak proof that makes it safe for transportation if results need lab confirmation. All these factors make this test cup one of the best in the market.